Kahotan's Blog | GOOD SMILE COMPANY Figure Reviews | The Nendoroid Petite Hatsune Miku Selection in Akiba! The set includes the 6 official Vocaloid characters together with another 6 fanmade characters for a total of 12 characters! Singles will be random and cost ¥600, but preorders will generally be for a complete box of 12 figures, so you can get the whole set all at once! They’re all so cute, that you really do want to grab them all together all at once! Hamako is in charge and has gone out to take a look, so let’s take a look at exactly what’s going on! Sofmap has GSC, Max Factory and many other companies figures on sale on the top floor of this building, so be sure to check out the store if you’re wandering around Akihabara! In the perfect position right on the main road of Akihabara is a huge Nendo Petite Miku Selection sign!! Yay!! The figures are normally just 6.5mm in height, but even when on a big sign like this they still look so adorable!! 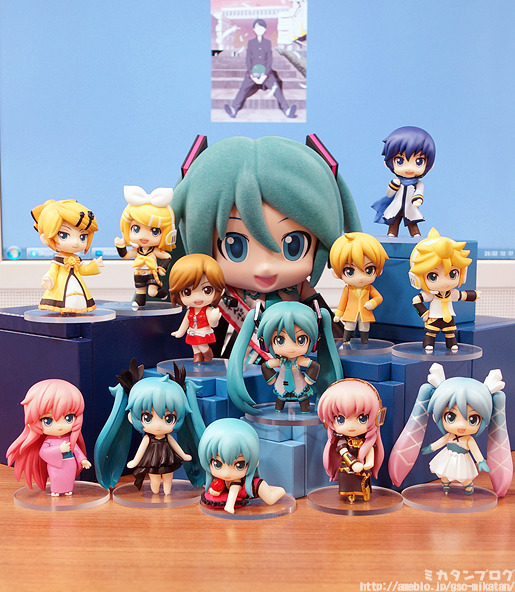 Publicity Ambassador Mikudayo is also here! Mikudayo has had quite an busy time helping out on the blog and GSC website recently, and now she’s even made sure that the Nendo Petites are on a beautiful sign like this! She’s working so very hard!! Now everyone who comes and goes through Akiba will see this sign and find out about the upcoming Nendo Petites! If you stop by, be sure to look out for the sign yourself!! There is also a TV commercial for them! The video is up on both YouTube and NicoNico Douga, and from tomorrow it will also be broadcast on TV! If you’re in Japan you might get to see it while watching your favorite shows too! The song used in the video is ‘Electric Angel’, which really suits the cute and colorful visuals! For those interested, the commercial will air on TOKYO MX, Sun TV, KBS Kyoto, TV Aichi, TV Hokkaido, BS11 and UHF channels across Japan. A special video featuring the fanmade characters! This video creates a beautiful atmosphere for each of the characters, it’s really beautiful!! A lot of effort was put into the small accessories and production of the video, so be sure to check it out! As was announced on the GSC site, we’ll be temporarily closing for staff training between the 13th and 15th March. Because of this, the blog will also be taking a break for the rest of the week. Sorry!